I have searched and searched, but haven't been able to find a solution for my requirement. Rounded corners for corner cells, and 1px thick border for the cells. But that leaves me without any borders for the cells. If I add borders, they aren't rounded! Secondly, to directly answer your question, border-radius doesn't actually display a border; it just sets how the corners look of the border, if there is one. To turn on the border, and thus get your rounded corners, you also need the border attribute on your td and th elements. You will also see the rounded corners if you have a background colour (or graphic), although of course it would need to be a different background colour to the surrounding element in order for the rounded corners to be visible without a border. Okay, this was bugging me, so I've done some testing. It seems like the critical thing you were missing was border-collapse:separate; on the table element. This stops the cells from linking their borders together, which allows them to pick up the border radius. For me, the Twitter Bootstrap Solution looks good. It excludes IE < 9 (no round corners in IE 8 and lower), but that's O.K. I think, if you develop prospective Web-Apps. Through personal expeirence I've found that it's not possible to round corners of an HTML table cell with pure CSS. Rounding a table's outermost border is possible. Download the plug-in, copy to a directory in your solution structure. Then in your stylesheet make sure to have the behavior tag so that it pulls in the plug-in. Don't worry if your Visual Studio CSS intellisense gives you the green underline for unknown properites, it still works when you run it. Some of the elements are not very clearly documented, but the examples are pretty good, especially on the front page. The selected answer is terrible. 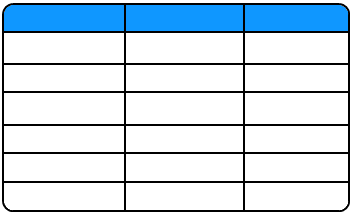 I would implement this by targeting the corner table cells and applying the corresponding border radius. To get the top corners, set the border radius on the first and last of type of the th elements, then finish by setting the border radius on the last and first of td type on the last of type tr to get the bottom corners. It is a little rough, but here is something I put together that is comprised entirely of CSS and HTML. This example also makes use of the :hover pseudo class for each data cell <td>. Elements can be easily updated to meet your needs, and the hover can quickly be disabled. If you use thead, tfoot or th, just replace tr:first-child and tr-last-child and td with them. box-shadow: 0 0 0 1px #000; // fake "border"
// Maybe there's no THEAD after the caption? Obviously the #contentblock portion can be replaced/edited as needed and you can find the border-radius.htc file by doing a search in Google or your favorite web browser. This is css3, only recent non-IE<9 browser will support it. it's about spacing color-filled cells within a div. Doing so, the black cell borders/table border are actually the div background color. Note that you'll need to set the div-border-radius about 2 values greater than the separate cell corner border radii, to take a smooth rounded corner effect. NOTE: The HTML/CSS code below should be viewed in IE only. The code will not be rendered correctly in Chrome! The cell border can pierce through the table border (ie: table boundary). ii. Delete the style rules which round the corner cells of the table. iii. Then play with border-spacing so you can see the interference. However, the table border and cell borders can be COLLAPSED (using: border-collapse: collapse;). i. If the table border is rounded but cell borders remain square, then the cell's shape takes precedence and the table loses its curved corners. ii. Conversely, if the corner cell's are curved but the table boundary is square, then you will see an ugly square corner bordering the curvature of the corner cells. i. Collapsing borders on the table (using: border-collapse: collapse;). ii. Setting your desired curvature on the corner cells of the table. iii. It does not matter if the table's corner's are rounded (ie: Its border-radius can be zero). Not the answer you're looking for? Browse other questions tagged html css html-table rounded-corners or ask your own question. Can I make a table line with rounded corners? How can I have a rounded border on my table and border-collapse: collapse?